Primary Myelofibrosis (PMF) is a chronic myeloproliferative disorder characterized by bone marrow fibrosis, splenomegaly, and anemia with nucleated and teardrop-shaped RBCs. The spleen is often very large. 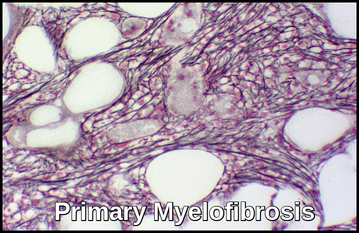 Myelofibrosis may be primary or secondary to a number of hematologic, malignant, and nonmalignant conditions e.g. PRV, ET, hairy cell leukemia, cancer with bone marrow metastases, osteomyelitis and TB. PMF is more common than secondary myelofibrosis and results from a neoplastic transformation of a multipotent bone marrow stem cell. These PMF progeny cells stimulate bone marrow fibroblasts to secrete excessive collagen. The disease is usually idiopathic. In this disorder, marrow fibrosis and extramedullary hemopoiesis (primarily in the liver and spleen) predominate. The fibrosis is probably reactive. There is anemia with anisocytosis and poikilocytosis and ‘tear drop‘ red cells (dacrocytes). Immature red and white cells in the blood ‘leukoerythroblastic blood film‘. Myeloblasts may be present, even in the absence of acute leukemia. Serum LDH level is often elevated. Platelet counts initially may be high, normal, or decreased; however, thrombocytopenia tends to supervene as the disorder progresses. Bone marrow failure eventually occurs, with consequent anemia and thrombocytopenia. Rapidly progressive, chemotherapy-incurable acute leukemia (usually M7 AML) develops in about 10% of patients. Bone marrow examination. Bone marrow aspiration is usually dry. Because demonstration of bone marrow fibrosis is required and fibrosis may not be uniformly distributed, a biopsy should be repeated at a different site if the first biopsy is nondiagnostic. Cytogenetic studies of bone marrow are helpful in excluding chronic myelogenous leukemia (CML), myelodysplastic syndrome, or other chronic myeloid disorders. However, as mentioned, these studies may be difficult to obtain due to “dry tap” on bone marrow aspirates in over 50% of patients with primary myelofibrosis. Fluorescent in situ hybridization (FISH) studies or polymerase chain reaction (PCR) assay testing for bcr:abl may be helpful in excluding CML (this may also be performed on peripheral blood). FISH studies for abnormalities associated with myelodysplastic syndromes, such as del 7, 7q-, and 5q-, may also be helpful. About 50% of patients have a JAK2 mutation. Some have a mutation of the calreticulin gene. Calreticulin (CALR) mutations were recently described in JAK2 and MPL unmutated primary myelofibrosis (PMF) and essential thrombocythemia. Among 254 study patients, 147 (58%) harbored JAK2, 63 (25%) CALR and 21 (8.3%) MPL mutations; 22 (8.7%) patients were negative for all three mutations (triple-negative myelofibrosis), whereas one patient expressed both JAK2 and CALR mutations. Serum LDH and uric acid. Historically, therapy for primary myelofibrosis was mainly supportive. Patients received transfusions as needed. Thrombocytosis could be managed with hydroxyurea and other palliative agents. Low-risk, asymptomatic patients may be observed without intervention. Patients with milder disease may still be treated with supportive therapies. Ruxolitinib (Jakafi), a JAK1/JAK2 inhibitor, is the first chemotherapeutic agent to be approved by the US Food and Drug Administration (FDA) for the treatment of myelofibrosis. Androgens, splenectomy, chemotherapy, and splenic embolization and radiation therapy have been used for palliation. Temporary use of low-dose corticosteroids may relieve symptoms. For younger patients with advanced disease, allogeneic stem cell transplantation may be beneficial. Nonmyeloablative allogeneic stem cell transplantation has been successfully used even in older patients. Although thalidomide and lenalidomide can alleviate anemia in myelofibrosis, their use is limited by their respective potential to cause peripheral neuropathy and myelosuppression. Pomalidomide is a second-generation thalidomide analogue with reduced toxicity and enhanced anticancer and immunological activity. The median survival is 5 yr from the onset, but variation is wide; some patients have a rapidly progressing disorder with short survival and some have a delay in initial diagnosis. Unfavorable prognostic markers include Hb < 10 g/dL, history of transfusions, leukocytosis and leukopenia, and platelet count < 100,000/μL. Patients in the least favorable risk group usually survive < 1 yr.
No treatment reverses or controls the underlying process except for allogeneic stem cell transplant. Mesa RA, Verstovsek S, Cervantes F, Barosi G, Reilly JT, Dupriez B, et al. Primary myelofibrosis (PMF), post polycythemia vera myelofibrosis (post-PV MF), post essential thrombocythemia myelofibrosis (post-ET MF), blast phase PMF (PMF-BP): Consensus on terminology by the international working group for myelofibrosis research and treatment (IWG-MRT). Leuk Res. 2007 Jun. 31(6):737-40. Klampfl T, Gisslinger H, Harutyunyan AS, Nivarthi H, Rumi E, Milosevic JD, et al. Somatic mutations of calreticulin in myeloproliferative neoplasms. N Engl J Med. 2013 Dec 19. 369(25):2379-90. Nangalia J, Massie CE, Baxter EJ, Nice FL, Gundem G, Wedge DC, et al. Somatic CALR mutations in myeloproliferative neoplasms with nonmutated JAK2. N Engl J Med. 2013 Dec 19. 369(25):2391-405. Verstovsek S, Mesa RA, Gotlib J, Levy RS, Gupta V, DiPersio JF, et al. A double-blind, placebo-controlled trial of ruxolitinib for myelofibrosis. N Engl J Med. 2012 Mar 1. 366(9):799-807. Gangat N, Caramazza D, Vaidya R, et al. DIPSS plus: a refined Dynamic International Prognostic Scoring System for primary myelofibrosis that incorporates prognostic information from karyotype, platelet count, and transfusion status. J Clin Oncol. 2011 Feb 1. 29(4):392-7.